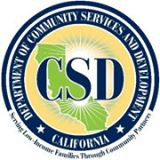 The Department of Community Services and Development (CSD) funnels federal money for energy and community service programs that assist low-income Californiams. The department partners with both public and private nonprofit agencies to sponsor special anti-poverty initiatives, and to provide in-house, low-income eligibility verification for several public and private utilities offering rate discounts. The department is in the state Health and Human Services Agency. CSD grew out of an amendment to the Economic Opportunity Act of 1964, a federal law that sought to combat poverty in the United States by using the resources of the country. In compliance with that amendment, governor Edmund G. Brown—like other governors—created California’s State Office of Economic Opportunity (SOEO). The SOEO became the liaison between the state and its anti-poverty programs. It was to review, monitor, recommend and assist state programs and projects, and assist local leadership to develop programs and apply for grants—all aimed at fighting poverty. Among the early programs that the office was to oversee were VISTA (Volunteers in Service to America), grants to improve rural farms, loans to small businesses, job training, a Job Corps for youth, and more. Most financing was to come from the federal Office of Equal Opportunity, with 10% from state and local sources. In the mid-1970s, SOEO was integrated into California’s new Employment Development Department. In 1981 it was moved to the Governor’s Office and designated the state’s anti-poverty agency. An 11-member Advisory Commission was also established in 1981 to advise the director of SOEO on goals and priorities. In that year, the SOEO was tasked with producing an annual report on poverty in California, with recommendations to alleviate that poverty. The SOEO came under fire again in 1984 when its director, Gilbert Montano, was forced to resign after newspapers revealed he was under investigation for possibly awarding public funds to “political favorites.” Another official of SOEO was convicted of stealing $67,500 in money meant for the Bay Area Preparatory Program. Also convicted was the director of the program that should have used the funds. The following year, Governor Deukmejian, who had appointed Montano, folded the SOEO into a new agency, the Department of Economic Opportunity (DEO). SOEO employees became part of civil service. A state budget act in 1992 abolished the Advisory Committee, and an executive order from Governor Pete Wilson linked the DEO (formerly the SOEO) to the state’s Health and Welfare Agency. The goal was to improve efficiency in coordinating services for the poor. Although this move was supposed to be temporary, the linkage remained in effect until another major change in 1996, when the DEO changed its name to the Department of Community Services and Development. No longer an independent agency, the director of CSD now reported to the secretary of the Health and Welfare Agency—which changed its name to the Health and Human Services Agency two years later. To help low-income families, CSD partners with service providers both private and public on the local community level. Another part of the department’s mission is to sponsor special anti-poverty initiatives. The department administers the state’s share of four federal programs: the Community Services Block Grant Program and the Low-Income Home Energy Assistance Program, both part of the U.S. Department of Health & Human Services; the Weatherization Assistance Program of the U.S. Department of Energy; and the Lead-Based Paint Hazard Control Program of the U.S. Department of Housing and Urban Development; and an 18-month demonstration Prisoner Reentry Program for the U.S. Department of Justice. CSD also administers a state Naturalization Services Program. Finally, CSD works with local grantees when a natural disaster strikes. The Community Services Block Grant Program (CSBG) can provide low-income Californians with services as basic as food and shelter and offer counseling. The department maintains a list of community agencies that are funded through block grants to help low-income families—both rural and urban, residents, migrant workers and Native Americans—achieve self-sufficiency. The income guidelines for this program are on the website. LIHEAP, the Low-Income Home Energy Assistance Program, assists families with energy bills. The department also provides in-house, low-income eligibility verification for several public and private utilities offering rate discounts; they maintain a list of energy providers as well. The energy assistance program also uses Recovery Act funds earmarked for weatherization of homes. Income Guidelines inform people whether they qualify for energy bill assistance. The Lead-Based Paint Hazard Control Program uses funds from the US Department of Housing and Urban Development not only to remediate lead-based paint in pre-1978 houses, but to train workers in remediation. A Resources page on the department’s website guides consumers to publications and reports about these programs, and to agendas and minutes for the various councils that administer the programs. And because the department also works with grantees to prepare for disaster assistance, a list of publications and programs aimed at emergencies is available. The department’s expenditures of $259.8 million are divided between energy programs, community services and administration. Energy programs include the Lead Hazard Control Program, the Department of Energy’s Weather Assistance Program and LIHEAP to subsidize heating and cooling costs for homes, weatherization and emergency funds. Around $194.3 million is budgeted for this, with $21.7 million going to state operations, and $172.6 million going to local assistance programs. Community Services is the Community Services Block Grant Program, and gets around $65.5 million. State operations account for $3.3 million, while local assistance takes $62.1 million. All this is funded by the Federal Trust Fund. In addition, the the department receives money from the American Recovery and Reinvestment Act of 2009: $186 million in funding to CSD through the Department of Energy’s Weatherization Assistance Program, and $89 million in a Community Services Block Grant, to be passed by the department to CSBG eligible entities. The Department of Community Services and Development has administered federally funded anti-poverty programs, in one form or another, since 1965. Its earliest incarnation was called the State Office of Economic Opportunity (SOEO). Early on, its programs included VISTA (Volunteers in Service to America), grants to improve rural farms, loans to small businesses, job training and a Job Corps for youth. For the most part, states were happy to take the federal government’s money, but in 1970, Governor Ronald Reagan vetoed SOEO grants worth $1.8 million that were headed for the nonprofit California Rural Legal Assistance (CRLA), which he called “ideological ambulance chasers.” Lewis K. Uhler, Reagan’s choice to head the SOEO, shared his boss’s professed desire to see smaller government and antipathy for social programs, and investigated the CRLA. His subsequent report echoed the governor’s low opinion of it. The 283-page report itemized around 150 charges of alleged misconduct, including school disruption, prison disruption, criminal representation, over-income clients and organizing labor unions. The rural poverty group was accused of “gross and deliberate violations” of federal Office of Economic Opportunity (OEO) regulations. In addition, a federal OEO team investigated California’s SOEO and charged it with using its funds to harass and spy on California’s anti-poverty programs instead of facilitating local programs that helped the poor. Miffed Sacramento lawmakers budgeted only $100 for the SOEO in 1971. Reagan ordered that $100,000 be transferred from his operating budget to pay the salaries of the agency’s personnel until a new bill could be passed, financing SOEO. The U.S. government renewed funding of the SOEO as well, but only after the federal director was satisfied that California’s agency “places increasing emphasis on assisting local communities and community action agencies in their anti-poverty programs,” and only after a new advisory council was set up to watch over the SOEO. Uhler, a Yale graduate and UC Berkeley-trained lawyer, left the agency and had a brief stint as assistant secretary at the state Health and Welfare Agency before becoming chairman in 1972 of the Governor’s Tax Reduction Task Force. He enlisted the likes of Nobel Laureates—and conservative icons—Milton Friedman and James M. Buchanan to help craft California’s Revenue Control and Limitation Act, which became a model for tax-expenditure limitation measures in many states. Uhler then left government and founded the National Tax Limitation Committee in 1975, which, among other things, is a sponsor today of Tea Party events around the country. In 1990, Uhler co-authored California’s Term Limit Act, Proposition 140. He co-wrote Red State Rising: How to Take Back America with Erick Erickson in 2010. Allegations of misuse of funds are rife throughout the State Office of Economic Opportunity’s (SOEO) first 20 years. In 1973, the federal Office of Economic Opportunity withheld $683,000 in grants from California pending an investigation. U.S. Senator Alan Cranston, (D-California) had asked the General Accounting Office to investigate and the GAO charged the SOEO with violating federal contract rules. Besides issuing contracts without proper authority, the GAO found that SOEO was hiring unqualified applicants and giving undeserved raises. An old problem—spending $133,000 on unauthorized investigations of other anti-poverty agencies—also surfaced. Did the SOEO clean up its act? In March 1984, Director Gilbert Montano resigned under a cloud while being investigated for collaborating with another state official to award moneys to political favorites. One SOEO official, Herbert Clayton, was convicted of stealing $67,500 that was to go to the Bay Area Preparatory Program. Ona Solon, director of that program, was also convicted of theft. Chon Gutierrez became Interim Director, tasked with cleaning up an agency whose practices and lack of oversight had led to scandal. The Legislature’s auditor general cited several instances of alleged misuse of funds and mismanagement; examples included using grant money for personal expenses and personal loans. Montano himself was never charged with any crime. His poor administration had repercussions that affected the career of another former head of SOEO, Gilbert Avila. After the resignations of Montano and another agency director, both Latino and both recommended by Avila, Avila himself was forced to resign as a top aide to Governor Deukmejian. What about now? Do these problems still crop up? CSD received $93 million in July 2009 to provide grants to weatherize low-income homes. The funds came from the 2009 American Recovery and Reinvestment Act and were intended not just to help low-income residents but also to provide jobs. Another $93 million was to be awarded in 2011. However, a state audit revealed no homes had been weatherized by December 2009. The department cited the fact that the feds didn’t provide prevailing wage guidelines, which were necessary for hiring contractors. The auditor faulted the department for being slow to negotiate and develop procedures for using the funds. Also, it demanded that the department improve its oversight of Recovery grant use and its cash management procedures. By April 22, 2010, a total of 2,934 homes had been weatherized and 1,174 more were in process. The department felt they were on track to weatherize 20,000 units by the end of 2010. That month, CSD Director Lloyd Throne resigned. According to figures published by CSD in June 2011, over 29,348 homes have been weatherized. So, yes, allegations of mishandling funds still surface, but the reasons seem to be mired in bureaucracy, rather than more colorful criminal malfeasance. The federal Office of Economic Opportunity, like the state offices it nurtured, was created as part of President Lyndon Johnson’s War on Poverty. Conservatives, including President Richard Nixon who followed Johnson, did not feel that the office accomplished its aims and set about to dismantle it. The office was scheduled to be stripped of funding in June 1974, but OEO Director Alvin J. Arnett tried to thwart Nixon’s efforts by travelling around the country rallying support in the states to continue its work. California’s Inspector General Laura Chick evaluated a San Diego area agency in 2010 that received $1.2 million in Recovery Act funds from CSD. Chick cited weak oversight of projects and files, lack of training by contractors, poor reporting, and other problems. The attached response from the Metropolitan Area Advisory Committee showed active engagement and communication between MAAC and CSD, addressing many of the problems. This was one of the last reports written by Chick, as her office was closed down when Jerry Brown took over as governor. Since problems in monitoring so many programs, contractors and the cash flow seems to be an ongoing problem for CSD, stretching back over the decades, the question of who will prod and investigate CSD in the future looms large. Weatherization refers to several techniques that reduce the costs of heating or cooling a home. Installing insulation, sealing doors and windows with weather-stripping, caulking cracks, replacing old appliances with energy-efficient appliances, installing smoke and carbon monoxide detectors, all fall under weatherization programs. The U.S. Department of Energy (DOE) began funding weatherization for low-income families through the Weatherization Assistance Program, which started as a pilot in 1975 and expanded to a state grant program in 1979. Annual funding appropriations from DOE and LIHEAP are distributed to 30 states, including California. Should the government be funding Weatherization? Many feel that weatherization funding should be ended and categorize such programs as pork and a drain on the budget. Since the 2009 American Recovery and Reinvestment Act committed $5 billion to weatherization and promised both energy savings and jobs, conservatives are apt to link weatherization to the Obama administration and waste. Homes are made energy efficient and safer through weatherization, say supporters of the program. The local economy is improved because materials are bought locally and money saved on energy costs is spent elsewhere. Carbon dioxide output is reduced and energy consumption goes down on a national scale. The programs train unemployed workers and youth in new skills. According to Weatherize.org, 52 jobs are created for every $1 million spent. Energy Secretary Steven Chu said in January 2011, “We are on pace to meet the goals of the Recovery Act. This program has already benefited 300,000 low-income families and put thousands of people to work. . . . Through the weatherization program, we are laying the groundwork for a broader efficiency industry in the U.S. that will help grow our economy while saving money for American families.” Chu’s press release went on to point out that those 300,000 homes translated to $161 million in energy cost savings during the first year alone. Lloyd Throne, 2006-2010. Throne resigned after an audit revealed that CSD had not distributed part of $93 million received from the American Recovery and Reinvestment Act. The money, earmarked to weatherize 50,000 homes, might have to be returned to the federal government. Lewis K. Uhler, 1970 – 1971. Appointed by Governor Reagan, one of Uhler’s first duties was to investigate and report on the California Rural Legal Assistance, an agency which served the state’s rural poor. Reagan despised the CRLA and had vetoed its funding grant from SOEO. Not surprisingly, Uhler’s report eviscerated the agency and made him many enemies. Reagan appointed Uhler to other important posts where he wrote the state’s Revenue Control and Limitation Act and (in 1990) co-authored California’s Term Limit Act, Proposition 140. Uhler’s career is unusual for a man who once headed an agency devoted to channeling money to the poor. Today a noted speaker and organizer, Uhler founded and heads the National Tax Limitation Committee. He co-wrote Red State Rising: How to Take Back America with Erick Erickson. Ending a string of acting department heads dating back to 2010, Linné K. Stout was appointed director of the Department of Community Services and Development (CSD) by Governor Jerry Brown in May 2013. Stout worked in various positions at the California Department of Social Services (CDSS) from 2001 to 2011. She was bureau chief of the department’s Resources Development and Training Support Bureau in 2009 when named chief of the Child Protection and Family Services Branch within the CDSS Children and Family Services Division. In this position, which Stout held until 2011, she provided oversight of the child welfare services in the area of emergency response, pre-placement and in-home services policy. This included oversight of statewide child abuse prevention and family support services to increase family strengths and capacity to enhance child development and provide children with a stable and supportive family environment. Stout was also responsible for statewide training and staff development activities of public child welfare service workers, and served on the Mental Health Planning Council. Previously, she served in various functions within the Administration Division of CDSS for most of her state career. She transferred to the Community Services and Development Department in 2011 to become acting chief deputy director. She was named acting director in 2012 before Brown removed “acting” from her title a year later. Stout has served as a Court Appointed Special Advocate (CASA) since 2004. The National CASA Association utilizes thousands of volunteers to watch over and represent abused and neglected foster youths as they fight their way through legal and social service systems. Appointed acting director of the California Department of Community Services and Development (CSD) by Governor Jerry Brown in May 2011, John A. Wagner received his bachelor’s degree from Marquette University, a master’s degree in public administration from the John F. Kennedy School of Government, Harvard University, and another master’s degree in public policy from Georgetown University. Before coming to California, Wagner was the assistant secretary for children, youth and families for the Massachusetts Executive Office of Health and Human Services. From 2002-2007, he was the commissioner for the Massachusetts Department of Transitional Assistance, one of the state’s largest agencies, overseeing cash assistance, food programs, and shelter for low-income residents. Wagner was named director of California’s Department of Social Services in 2007, administering programs serving more than 3 million residents, including foster children, families receiving aid through the CalWORKS program, the elderly in licensed care facilities, ant the blind who get assistance from In-Hope Supportive Services or Supplemental Security Income/State Supplementary Program. Wagner left the CSD in 2012 to become chief operating officer of First 5 LA.